Description - Our Stone-Loc Tiles provide the look of real stone with a flexible, warm surface. These tiles feature a unique back that elevate the surface above any potential dampness. Truly durable, these tiles have a rim that protects the vinyl from any damage making them perfect for trade shows. Our Stone-Loc Tiles are backed by a 10 year warranty and will compliment any residential or commercial area. Material – Luxury Vinyl Tile inserted into high impact polypropylene. Size – 1' x 1' (Note: Tiles do overlap 1.875” where they lock together). Weight – Each tile weighs approximately 1.75 Lbs. Recommended Uses - Our Stone-Loc Tiles have been used as flooring in aerobic rooms, bedrooms, basements, family rooms, laundry rooms, trade shows, and much more. 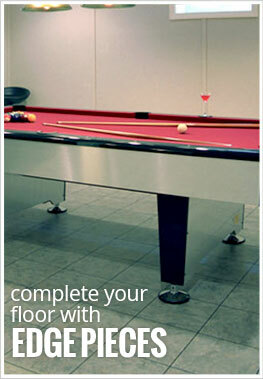 Our Stone-Loc Tiles can be maintained just like your carpet at home. Special pegs elevate above dampness.